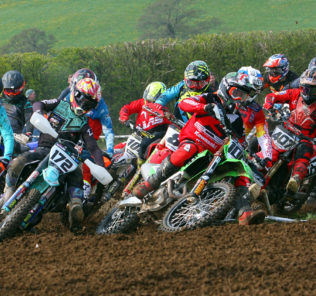 Wilden MXC kicked off their Polesworth Challenge last Sunday in superb style with a busy line up filled with talent across all classes. The track didn’t disappoint either with prime conditions allowing lines to develop as the day unfolded. The adult open class had attracted a tantalizing line up with Howard Wainwright, Rob Yates and the Putnam boys; Ben & Charlie taking the spot light. It wouldn’t be easy for anyone though with a full gate of expert riders. The junior classes weren’t lacking on talent either with riders including Ben Askew, Kyle Ingram and Jenson Severn signing up for round one. Adding an extra flavour once again were the quads and sidecars. Alex Bethell would lead the quad entry list whilst the new pairing of Jake Brown and Zac Snell were drawing the eye in the sidecars. The Auto class kicked off the day with three riders immediately standing out. Jenson Severn, Ollie Walters and Joe Winstanley were away at the front for all three races. It was Severn who proved dominant though taking three races wins looking comfortable at the front. 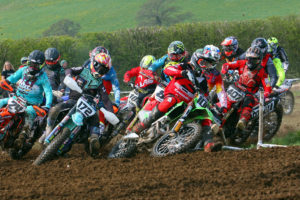 Walters and Winstanley fought hard over second in every moto with Walters consistent pace securing him second overall. Winstanley wrapped up third overall with a healthy advantage on fourth place finisher Cassidy Brand. In the SW auto class it was to be a maiden overall win for Josh Keay whose 2-1-1 finishes saw him end on 132 points, a great way to kick off his championship challenge. Chad Stevenson was the best of the rest taking second overall and a race win in the opening moto. Third overall fell to Chase Edmunds on 114 points just 7 points clear of George Carson in fourth. Ben Askew was on another level in the 65cc group taking three dominant race wins and the overall on 135 points. The battle for second overall was hotly contested with Oli Rigby, Joe Benfield and Franky Jubb all taking a swing at second. Rigby was the fast starter bagging a couple of brilliant hole shots before indulging in battles with Benfield and Jubb. Taking second overall as the close was Benfield with three second place finishes. Rigby rounded off the podium in third overall taking away positives for round two in a couple of weeks. Jubb would drop of the box after a final race off saw him drop down the order. Just missing out on a podium finish after a brilliant performance was Harley Prickett scoring his highest finish in the 65cc class. In the BW85cc class Callum Baldwin was one of the clever few that had came to practice at Polesworth earlier in the month. Using his extra track time to good effect he dominated all three races in an impressive fashion looking back only when the flag fell. Three race wins and 135 points were the perfect combination for the overall. Thomas Clair bagged second overall in the BW class running just behind Kyle Ingram in the overall. Coming on strong in the closing stages of the second race was Kai Reason and backing that up with another great ride in the final race, he would take third overall. In the SW class it was Kyle Ingram who proved unbeatable running a great pace that saw him battling with the BW riders. A clean sweep of wins wrapped up the overall for Ingram ahead of a gusty AJ Simpson whose opening two races secured him the spot. Kian Day would just miss out on second overall but a third overall was still an impressive result. The adult C group was wide open with over 35 riders lining the gate. Three riders were a constant force throughout the day with Tom Kimpton, Paul Groom and David Dunn all tasting victory. It was Groom who made the best start taking the opening race win after a hard a push early on the catch fast rookie Leo Whordley. Kimpton struck second with a win the second race just ahead of an everfaster Dunn. Final time round and sure enough it was Dunn who looked quickest bagging the win. However, a fall in the opening race saw his overall hindered. Taking second in the final race was enough for Kimpton to wrap up the overall just four points clear of Groom in second. Squeezing onto the box in third overall was William Clair whose consistent pace proved the difference as he tied on points with Whordley. Dunn managed sixth overall with his final race win, but he will be hoping for better luck next time out. The adult open was a confusing affair with several riders bagging wins across the three lengthy races. Ben Putnam was the first to strike firing out the gate with the opening race hole shot, commanding the pace at the front taking the win. Sadly though it would be his only race as come race two the No.111 was missing from the line-up. Two riders showing great pace from the off set were Rob Yates and Howard Wainwright. Both riders would be moving up to MX2 Pro class for 2018 so pride was at stake. Yates made the better start taking second in the opening race with Wainwright just inches behind at the flag. Bouncing back in the second moto, Wainwright powered to the win with an impressive display of speed over Yates. Charlie Putnam was fighting back after a DNF in race one, the Yamaha rider entered the fight with a third in the second race but would need even more to climb the overall. Final race and it was Yates this time that came out charging away at the front. With a two second lead on Wainwright it looked like he had done enough but a push in the closing stages saw the gap close. When the clock ticked over it was Yates that took the final race win, enough to steal the overall by just two points over Wainwright. Putnam rounded off the top three in the final race but 11th overall was the best he could manage in a competitive field. Scoring consistently in every race and tallying up the points for third overall was Connor Halligan whose two fourth place finishes in the final two races tipped the final spot on the podium in his favour. James Smith would just miss out on the podium after a tough final race but good speed will be a positive for next time out. Alex Bethell was a dominant force in the quads taking all three race wins with a massive advantage over second in every race. Axel Bone was looking like the best of the rest showing great speed in the opening race but a DNF in the second race pushed him down the overall standings. Stepping up her pace once again was Sophie Bosworth whose 3-2-3 finishes bagged her second overall on 122 points. Lee Waring rounded out the top three just ahead of Shelly Smark. Newly paired Jake Brown and Zac Snell were the best of the sidecars bagging three class wins and the overall in the sidecar field. Shane & Paul Horton showed great pace in the final two races but a mechanical DNF in the opening race saw them settle for fifth overall. Taking second overall was the Rob Moss and Ryan Henderson KTM outfit with a 2-3-3 result. Wrapping up the sidecar top three was Ben Parr and Eric Mcguire on 116 points.